Walter Heinrich Munk (October 19, 1917 – February 8, 2019) was an American physical oceanographer. He was a professor of geophysics at the Scripps Institution of Oceanography at the University of California, San Diego in La Jolla. Born to a prominent Austrian family, in 1932 Munk was sent to school in the United States at age 14. Abandoning a New York banking career, Munk obtained a scientific education at the California Institute of Technology and his doctorate from Scripps. During World War II, Munk and his doctoral advisor Harald Sverdrup developed methods for predicting surf conditions on beaches, saving countless lives during allied landings in North Africa, the Pacific, and Northern Europe. After the war, Scripps grew from a small biological station to a major research institution. Munk and his wife Judy were active in developing the Scripps campus and integrating it with the new University of California, San Diego. One of the first to bring statistical methods to the analysis of oceanographic data, Munk's work is noted for creating fruitful areas of research that continue to be explored. These areas include surface waves, geophysical implications of variations in the Earth's rotation, tides, internal waves, deep-ocean drilling into the sea floor, acoustical measurements of ocean properties, sea level rise, and climate change. In a 1991 experiment, Munk and his collaborators tested the ability of underwater sound to propagate from the Southern Indian Ocean across all ocean basins. The aim was to use the acoustic signals to measure changes in broad-scale ocean temperatures. The experiment was criticized by environmental groups, who expected that the loud acoustic signals would adversely affect marine life. Munk was a member of the JASON think tank, and he held a Secretary of the Navy/Chief of Naval Operations Oceanography Chair. Munk died at age 101 in La Jolla, California. Munk in Stockholm in 2010 to accept his Crafoord Prize. Munk was born in 1917 in Vienna, Austria-Hungary, to a Jewish family. His father, Dr. Hans Munk, and his mother, Rega Brunner, divorced when Munk was ten years old. His maternal grandfather was a prominent banker and Austrian politician, Lucian Brunner (1850–1914). His stepfather, Dr. Rudolf Engelsberg, was head of the salt mine monopoly of the Austrian government. He was therefore a member of the Austrian governments of first Chancellor Engelbert Dollfuss (assassinated by Nazis in 1934) and then Chancellor Kurt Schuschnigg (resigned after Nazi Germany annexed Austria, the Anschluss, in 1938). In 1932, Munk was performing poorly in school, because he was spending too much time skiing. So, his family sent him to a boys' preparatory school in upper New York state. His family envisioned a career for Munk in finance with a New York bank connected to the family business. Munk worked at the family's banking firm for three years and studied at Columbia University. Munk hated banking, however, and in 1937 he left the firm to attend the California Institute of Technology (Caltech) in Pasadena. While at Caltech, he took a summer job in 1939 at the Scripps Institution of Oceanography (Scripps) in La Jolla, California. Munk earned a B.S. in applied physics in 1939 and an M.S. in geophysics in 1940 at Caltech. Though the M.S. degree was from Caltech, the work was based on oceanographic data collected in the Gulf of California by the Norwegian oceanographer Harald Sverdrup. Sverdrup, the director of Scripps, was the thesis advisor. In 1939, Munk asked Sverdrup to take him on as a doctoral student. Sverdrup agreed, but told Munk that he did "not know of a single job in oceanography which would become available in the next decade". However, Munk's studies were interrupted by the outbreak of World War II. He completed his doctoral degree in oceanography at Scripps under the University of California, Los Angeles in 1947. Munk applied to be a citizen of the United States in 1938, but he failed the citizenship test by giving an overly-detailed answer to a question about the Constitution. Munk obtained American citizenship in 1939. Munk married Martha Chapin in the late 1940s. The marriage ended in divorce in 1953. On June 20, 1953, Munk married Judith Horton. She was an active participant at Scripps for decades, where she made contributions to architecture, campus planning, and the renovation and reuse of historical buildings. The Munks were frequent traveling companions. Judith Munk died in 2006. Munk married La Jolla community leader Mary Coakley in June 2011. Munk turned 100 in October 2017. He died of pneumonia on February 8, 2019 at La Jolla, California, aged 101. After the Anschluss, Munk enlisted in the ski troops of the U.S. Army as a private in 1940. Enlistment in the Army was unusual, as all the other young men at Scripps joined the U.S. Naval Reserve. At the request of Sverdrup and Roger Revelle, Munk was discharged from military service to undertake defense-related research at Scripps. His discharge was in December 1941, a week before the Japanese Attack on Pearl Harbor. He joined several of his colleagues from Scripps at the U.S. Navy Radio and Sound Laboratory, where they developed methods related to antisubmarine and amphibious warfare. The Normandy landing is famous because weather conditions were very poor and you may not realize it was postponed by General Eisenhower for 24 hours because of the prevailing wave conditions. And then he did decide, in spite of the fact that conditions were not favorable, it would be better to go in than lose the surprise element, which would have been lost if they waited for the next tidal cycle [in] two weeks. In 1946, the United States tested two fission nuclear weapons (20 kilotons) at Bikini Atoll in the equatorial Pacific in Operation Crossroads. Munk helped to determine the currents, diffusion, and water exchanges affecting the radiation contamination from the second test, code-named Baker. Munk returned to the equatorial Pacific six years later to Eniwetok Atoll, for the 1952 test of the first fusion nuclear weapon (10 megatons), code-named Ivy Mike. Roger Revelle, John Isaacs, and Munk had initiated a program for monitoring for the possibility of a large tsunami generated from the test. After receiving his doctorate in 1947, Munk was hired by Scripps as an assistant professor of geophysics. He became a full professor there in 1954. In 1955, Munk took a sabbatical at Cambridge University in England with a Guggenheim Fellowship. Returning to Scripps in 1956, Munk developed plans for a La Jolla branch of the Institute of Geophysics (IGP). IGP was an institution of the University of California system, and Munk's faculty appointment was at its Los Angeles campus. With the new branch to be focused on planetary physics with an emphasis on the Earth-Moon system, IGP changed its name to the Institute of Geophysics and Planetary Physics (IGPP). IGPP at La Jolla was built between 1959–1963 with funding from the University of California, the U.S. Air Force Office of Scientific Research, the National Science Foundation, and private foundations. The redwood building was designed by architect Lloyd Ruocco, in close consultation with Judith and Walter Munk. The IGPP buildings have become the center of the Scripps campus. Among the early faculty appointments were Carl Eckart, George Backus, Freeman Gilbert and John Miles. The eminent geophysicist Sir Edward "Teddy" Bullard was a regular visitor to IGPP. In 1971 an endowment of $600,000 was established by Cecil Green to support visiting scholars, now known as Green Scholars. Munk served as director of IGPP/LJ from 1962–1982. As an academic institution, from 1938 until 1958 Scripps was under the administration of the University of California, Los Angeles. Scripps became part of the University of California, San Diego when it was formed in 1958. Roger Revelle, then director of Scripps, was a primary advocate for establishing the La Jolla campus. In the late 1980s, plans for an expansion of IGPP were developed by Judith and Walter Munk, and Sharyn and John Orcutt, in consultation with a local architect, Fred Liebhardt. The Revelle Laboratory was completed in 1993. At this time the original IGPP building was renamed the Walter and Judith Munk Laboratory for Geophysics. In 1994 the Scripps branch of IGPP was renamed the Cecil H. and Ida M. Green Institute of Geophysics and Planetary Physics. In 1968, Munk became a member of JASON, a panel of scientists who advise the U.S. government. In 1981, Munk became a founding member of the World Cultural Council. Munk held a Secretary of the Navy/Chief of Naval Operations Oceanography Chair from 1985 until his death in 2019. [Walter has] a sometimes uncanny ability to delineate the essence - that had eluded his predecessors - of a central problem. He has the knack of defining a field in a way that requires decades of subsequent work by others to fully flesh-out, while he himself moves on. One of his explicitly stated themes is that it is more important to ask the right questions than it is to give the right answers. In 1948, Munk took a year's sabbatical to visit Sverdrup in Oslo, Norway on his first Guggenheim Fellowship. He worked on the problem of wind-driven ocean circulation. Munk's pioneering research, published in 1950, shows that Gulf Stream transport can be estimated by integrating the wind stress across the Atlantic. Munk coined the term "wind-driven gyres," a term now widely used. In the 1950s, Munk investigated irregularities in the Earth's rotation, such as the Chandler wobble and annual and long-term changes in the length of day (rate of the Earth's rotation). These small variations are related to geophysical processes, such as the changes in the atmosphere, ocean, and core, and the energy dissipated by tidal acceleration. He also investigated how western boundary currents, such as the Gulf Stream, dissipated planetary vorticity. Munk thoroughly reviewed and explored the subject in the 1960 monograph, written with G.J.F. MacDonald, The Rotation of the Earth: A Geophysical Discussion. The discussion is written from a geophysical, rather than astronomical, perspective, in particular, the monograph emphasizes using variation in the Earth's rotation to infer geophysical properties. The monograph is a standard reference. Project Mohole contracted with a consortium of oil companies use of their oil drillship CUSS I to drill into the sea floor in deep water. In 1957, Munk and Harry Hess suggested the idea behind Project Mohole: to drill into the Mohorovicic Discontinuity and obtain a sample of the Earth's mantle. While such a project was not feasible on land, drilling in the open ocean would be more feasible, because the mantle is much closer to the sea floor. Initially led by the informal group of scientists known as the American Miscellaneous Society (AMSOC, including Hess, Maurice Ewing, and Roger Revelle), the project was eventually taken over by the National Science Foundation (NSF). Initial test drillings into the sea floor led by Willard Bascom occurred off Guadalupe Island, Mexico in March and April 1961. The project was mismanaged and grew in expense after the construction company Brown and Root won the contract to continue the effort, however, and Congress discontinued the project toward the end of 1966. While Project Mohole was not successful, the idea led to projects such as NSF's Deep Sea Drilling Program. Munk conducted groundbreaking research on R/P FLIP's first science mission, leading to an increased understanding of waves traveling across ocean basins. Starting in the late 1950s, Munk returned to the study of ocean waves. Thanks to his acquaintance with John Tukey, he pioneered the use of power spectra in describing wave behavior. This work culminated with an expedition that he led in 1963 called "Waves Across the Pacific" to observe waves generated by storms in the Southern Indian Ocean. Such waves traveled northward for thousands of miles across the Pacific Ocean. To trace the path and decay of the waves, he established measurement stations on islands and at sea (on R/P FLIP) along a great circle from New Zealand, to the Palmyra Atoll, and finally to Alaska. Munk and his family spent nearly the whole of 1963 on American Samoa for this experiment. Walter and Judith Munk collaborated in making a film to document the experiment. The results show little decay of wave energy with distance traveled. This work, together with the wartime work on wave forecasting, led to the science of surf forecasting, one of Munk's best-known accomplishments. Munk's pioneering research into surf forecasting was acknowledged in 2007 with an award from the Groundswell Society, a surfing advocacy organization. Between 1965 and 1975, Munk turned to investigations of ocean tides, partially motivated by their effects on the Earth's rotation. Modern methods of time-series and spectral analysis were brought to bear on tidal analysis, leading to the development of the "response method" of tidal analysis. With Frank Snodgrass, Munk developed deep-ocean pressure sensors that could be used to provide tidal data far from any land. One highlight of this work was the discovery of the semidiurnal amphidrome midway between California and Hawaii. At the time of Munk's dissertation for his master's degree in 1939, internal waves were considered to be an uncommon phenomenon. By the 1970s, there were extensive published observations of internal-wave variability in the oceans in temperature, salinity, and velocity as functions of time, horizontal distance, and depth. Motivated by a 1958 paper by Owen Philips that described a universal spectral form for the variance of ocean surface waves as a function of wave number, Chris Garrett and Munk attempted to make sense of the observations by postulating a universal spectrum for internal waves. According to Munk, they chose a spectrum that could be factored into a function of frequency times a function of vertical wave number. The resulting spectrum, now called the Garrett-Munk Spectrum, is roughly consistent with a large number of diverse measurements that had been obtained over the global ocean. The model evolved over the subsequent decade, denoted GM72, GM75, GM79, etc., according to the year of publication of the revised model. Although Munk expected the model to be rapidly obsolete, it proved to be a universal model that is still in use. Its universality is interpreted as indicating profound processes governing internal wave dynamics, turbulence and fine-scale mixing. Klaus Hasselmann commented in 2010, "...the publication of the GM spectrum has indeed been extremely fruitful for oceanography, both in the past and still today." During the 1991 Heard Island Feasibility Test (HIFT), acoustic signals were transmitted from the MV Cory Chouest steaming near Heard Island in the Southern Indian Ocean. The signals followed geodesic paths to receivers located throughout the world oceans. The experiment tested the ability of sound to measure the temperatures of the major ocean basins. Beginning in 1975, Munk and Carl Wunsch of the Massachusetts Institute of Technology pioneered the development of acoustic tomography of the ocean. With Peter Worcester and Robert Spindel, Munk developed the use of sound propagation, particularly sound arrival patterns and travel times, to infer important information about the ocean's large-scale temperature and current. This work, together with the work of other groups, eventually motivated the 1991 "Heard Island Feasibility Test" (HIFT), to determine if man-made acoustic signals could be transmitted over antipodal distances to measure the ocean's climate. The experiment came to be called "the sound heard around the world." During six days in January 1991, acoustic signals were transmitted by sound sources lowered from the M/V Cory Chouest near Heard Island in the southern Indian Ocean. These signals traveled half-way around the globe to be received on the east and west coasts of the United States, as well as at many other stations around the world. The follow-up to this experiment was the 1996–2006 Acoustic Thermometry of Ocean Climate (ATOC) project in the North Pacific Ocean. Both HIFT and ATOC engendered considerable public controversy concerning the possible effects of man-made sounds on marine mammals. Tomography has come to be a valuable method of ocean observation, exploiting the characteristics of long-range acoustic propagation to obtain synoptic measurements of average ocean temperature or current. Applications have included the measurement of deep-water formation in the Greenland Sea in 1989, measurement of ocean tides, and the estimation of ocean mesoscale dynamics by combining tomography, satellite altimetry, and in situ data with ocean dynamical models. In addition to the decade-long measurements obtained in the North Pacific, acoustic thermometry has been employed to measure temperature changes of the upper layers of the Arctic Ocean basins, which continues to be an area of active interest. Acoustic thermometry has also been used to determine changes to global-scale ocean temperatures using data from acoustic pulses traveling from Australia to Bermuda. In the 1990s, Munk returned to the work on the role of tides in producing mixing in the ocean. In a 1966 paper "Abyssal Recipes", Munk was one of the first to assess quantitatively the rate of mixing in the abyssal ocean in maintaining oceanic stratification. At that time, the tidal energy available for mixing was thought to occur by processes near ocean boundaries. According to Sandström's theorem (1908), without the occurrence deep mixing, driven by, e.g., internal tides or tidally-driven turbulence in shallow regions, most of the ocean would become cold and stagnant, capped by a thin, warm surface layer. The question of tidal energy available for mixing was reawakened in the 1990s with the discovery, by acoustic tomography and satellite altimetry, of large-scale internal tides radiating energy away from the Hawaiian Ridge into the interior of the North Pacific Ocean. Munk recognized that the tidal energy from the scattering and radiation of large-scale internal waves from mid-ocean ridges was significant, hence it could drive abyssal mixing. In his later work, Munk focused on the relation between changes in ocean temperature, sea level, and the transfer of mass between continental ice and the ocean. This work described what came to be known as "Munk's enigma", a large discrepancy between observed rate of sea level rise and its expected effects on the earth's rotation. Munk was elected to the National Academy of Sciences in 1956 and to the Royal Society of London in 1976. He was both a Guggenheim Fellow (1948, 1953, 1962) and a Fulbright Fellow. He was named California Scientist of the Year by the California Museum of Science and Industry in 1969. Munk gave the 1986 Bakerian Lecture at the Royal Society on Ships from Space (paper) and Acoustic monitoring of ocean gyres (lecture). In July 2018 at the age of 100, Munk was appointed a Chevalier of France's Legion of Honour in recognition of his contributions to oceanography. Among the many other awards and honors Munk received are the Arthur L. Day Medal of the Geological Society of America in 1965, the Sverdrup Gold Medal of the American Meteorological Society in 1966, the Gold Medal of the Royal Astronomical Society in 1968, the first Maurice Ewing Medal of the American Geophysical Union and the U.S. Navy in 1976, the Alexander Agassiz Medal of the National Academy of Sciences in 1976, the Captain Robert Dexter Conrad Award of the U.S. Navy in 1978, the National Medal of Science in 1983, the William Bowie Medal of the American Geophysical Union in 1989, the Vetlesen Prize in 1993, the Kyoto Prize in 1999, the first Prince Albert I Medal in 2001, and the Crafoord Prize of the Royal Swedish Academy of Sciences in 2010 "for his pioneering and fundamental contributions to our understanding of ocean circulation, tides and waves, and their role in the Earth's dynamics". In 1993, Munk was the first recipient of the Walter Munk Award given "in Recognition of Distinguished Research in Oceanography Related to Sound and the Sea." This award is given jointly by the Oceanography Society, the Office of Naval Research and the US Department of Defense Naval Oceanographic Office. Waves Across the Pacific on YouTube (1967) – a documentary showcasing Munk's research on waves generated by Antarctic storms. The film documents Munk's collaboration as they track storm-driven waves from Antarctica across the Pacific Ocean to Alaska. The film features scenes of early digital equipment in use in field experiments with Munk's commentary on how unsure they were about using such new technology in remote locations. One Man's Noise: Stories of An Adventuresome Oceanographer on YouTube (1994) – a television program on the work and life of Walter Munk produced by the University of California. Spirit of Discovery (2017) – a documentary showcasing Munk as he goes in search of Mobula munkiana a species that bears his name. A Conversation with Walter Munk (2019) – Carl Wunsch interviews Walter Munk about his life, career, and scientific events and people during his life on the occasion of his 100th birthday in 2017. ^ a b c d e "Obituary Notice: Walter Munk, World-Renowned Oceanographer, Revered Scientist". Scripps Institution of Oceanography. February 8, 2019. Retrieved February 9, 2019. ^ Dicke, William (9 February 2019). "Walter H. Munk, Scientist-Explorer Who Illuminated the Deep, Dies at 101". The New York Times. Retrieved 11 February 2019. ^ NBC 7 Staff. "World-Renowned Oceanographer Walter Munk Dies at 101". NBC 7 San Diego. Retrieved 11 February 2019. ^ a b Robbins, Gary. "Walter Munk, La Jolla scientist-explorer dubbed the 'Einstein of the Oceans,' dies at 101". latimes.com. Retrieved 11 February 2019. ^ a b Walter Munk (1946). "Increase in the period of waves traveling over large distances: with applications to tsunamis, swell, and seismic surface waves". University of California, Los Angeles Library. p. 41. Retrieved February 18, 2019. ^ a b c Yam, P (1995). "Profile: Walter H. Munk – The Man Who Would Hear Ocean Temperatures". Scientific American. 272 (1): 38–40. Bibcode:1995SciAm.272a..38Y. doi:10.1038/scientificamerican0195-38. ^ a b Galbraith, Kate (August 24, 2015). "Walter Munk, the 'Einstein of the Oceans'". The New York Times. Retrieved February 10, 2019. ^ a b c d e f g h i j k l m n o p q r s t u v w von Storch, Hans; Klaus Hasselmann (2010). Seventy Years of Exploration in Oceanography: A Prolonged Weekend Discussion with Walter Munk. Berlin: Springer-Verlag. doi:10.1007/978-3-642-12087-9. ISBN 978-3-642-12086-2. ^ a b c d Adelmann, Pepita (April 15, 2008). "Introducing Walter Munk, or "The Old Man and the Sea"". Bridges. 17. Retrieved February 16, 2019. ^ a b Lawrence Armi (28 September 1994). "Transcript of Oral History interview of Walter Munk". American Meteorological Society Oral History Project, National Center for Atmospheric Research. Retrieved February 16, 2019. ^ a b c d e Munk, Walter H. (1980). "Affairs of the Sea". Annual Review of Earth and Planetary Sciences. 8: 1–17. Bibcode:1980AREPS...8....1M. doi:10.1146/annurev.ea.08.050180.000245. ^ Munk, Walter H. (1940). Internal waves in the Gulf of California (Thesis). California Institute of Technology. ^ a b McAllister, Toni (February 8, 2019). "Pioneering Scripps Oceanographer Walter Munk Dead at 101". Times of San Diego. Retrieved February 10, 2019. ^ "Walter Munk, known as the 'Einstein of the ocean,' has turned 100". October 19, 2017. ^ Dicke, William (February 9, 2019). "Walter H. Munk, Scientist-Explorer Who Illuminated the Deep, Dies at 101". nytimes.com. New York Times. Retrieved February 10, 2019. She said the cause of death was pneumonia. ^ a b D. Day (August 31, 2005). "Walter Heinrich Munk Biography" (PDF). Scripps Institution of Oceanography Archives. Retrieved February 17, 2019. ^ a b "Walter Munk: One Of The World's Greatest Living Oceanographers". CBS 8. November 2, 2009. Retrieved August 20, 2010. ^ "Walter Munk Biography, Research Professor of Geophysics Cecil H. and Ida M. Green Institute of Geophysics and Planetary Physics". Scripps Institution of Oceanography University of California, San Diego. March 2017. Retrieved February 14, 2019. ^ a b c d W. Munk; F. Gilbert; J. Orcutt; M. Zumberg; R. Parker (2003). "The Cecil H. and Ida M. Green Institute of Geophysics and Planetary Physics (IGPP)" (PDF). Oceanography. 16. pp. 34–44. doi:10.5670/oceanog.2003.29. ^ "The Cecil H. and Ida M. Green Institute of Geophysics and Planetary Physics (IGPP)". Retrieved November 2, 2010. ^ Stadtman, Verne A. (1970). The University of California, 1868-1968. McGraw-Hill. pp. 407–411. Retrieved May 5, 2013. ^ Munk, W. (1997). "Tribute to Roger Revelle and his contribution to studies of carbon dioxide and climate change". Proceedings of the National Academy of Sciences of the United States of America. 94 (16): 8275–8279. doi:10.1073/pnas.94.16.8275. ^ "Walter Munk". Physics Today. October 17, 2017. doi:10.1063/PT.6.6.20171019a. Retrieved February 13, 2018. ^ a b Spindel, R.C. ; Worcester, P.F. (2016). "Walter H. Munk: Seventy-Five Years of Exploring the Seas" (PDF). Acoustics Today. 12 (1): 36–42. Retrieved February 19, 2019. ^ a b Munk, Walter; Wunsch, Carl (2019). "A Conversation with Walter Munk". Annual Review of Marine Science. 11: 15–25. doi:10.1146/annurev-marine-010318-095353. ^ Munk, W. (1950). "On the wind-driven ocean circulation". Journal of Meteorology. 7: 79–93. ^ Groves, G.W. (1961). "Dynamics of the Earth-Moon System". In Kopal, Z. Physics and Astronomy of the Moon. New York: Academic Press. pp. 61–98. ^ Lambeck, K.; Cazenave, A. (1977). "The Earth's variable rate of rotation: A discussion of some meteorological and oceanic causes and consequences". Phil. Trans. Roy. Soc. A. 284 (1326): 495–506. Bibcode:1977RSPTA.284..495L. doi:10.1098/rsta.1977.0025. ^ "Project Mohole". IODP. Archived from the original on 6 March 2014. Retrieved 5 March 2014. ^ Steinbeck, John (April 14, 1961). "High drama of bold thrust through the ocean floor: Earth's second layer is tapped in prelude to MOHOLE". Life Magazine. Retrieved September 11, 2010. ^ Sweeney, Daniel (1993). "Why Mohole was no hole". Invention and Technology Magazine – American Heritage. 9. pp. 55–63. Archived from the original on December 1, 2008. Retrieved August 14, 2011. ^ The National Academies (2005). "Project Mohole 1958–1966". Retrieved September 5, 2010. ^ Waters, Hannah (July 2012). "FLIP: The FLoating Instrument Platform". Smithsonian Institution. Retrieved June 7, 2018. ^ Munk, Walter (1964). "Excerpts from Waves Across the Pacific". Palmyra Atoll Digital Archive. ^ Lee S. Dutton (May 13, 2013). Anthropological Resources: A Guide to Archival, Library, and Museum Collections. Routledge. p. 77. ISBN 978-1-134-81893-8. ^ Snodgrass, F.E. ; G.W. Groves; K.F. Hasselmann; G.R. Miller; W.H. Munk; W.H. Powers (1966). 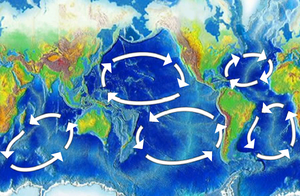 "Propagation of ocean swell across the Pacific". Philos. Trans. R. Soc. Lond. A. 259 (1103): 431–497. Bibcode:1966RSPTA.259..431S. doi:10.1098/rsta.1966.0022. ^ Fikes, Bradley (January 21, 2010). "SIO's Walter Munk Wins Crafoord Prize". North County Times blogs. Archived from the original on January 26, 2010. Retrieved August 20, 2010. ^ Casey, Shannon (May 2007). "Isn't He Swell?". Explorations. Retrieved August 20, 2010. ^ Munk, W.; D.E Cartwright (1966). "Tidal spectroscopy and prediction". Philos Trans R Soc Lond. A 259: 533–581. ^ Cartwright, David (1999). Tides: A Scientific History. Cambridge: Cambridge University Press. ISBN 978-0-521-62145-8. ^ Munk, W.; F. Snodgrass & M. Wimbush (1970). "Tides off shore: transition from California coastal to deep-sea waters". Geophys. Fluid Dyn. 1 (1–2): 161–235. Bibcode:1970GApFD...1..161M. doi:10.1080/03091927009365772. ^ Munk, W.; Garrett, C.J.R. (1972). "Space-time scales of internal waves". Geophys. Fluid Dynam. 2: 225–264. doi:10.1080/03091927208236082. ^ Munk, W.; Garrett, C.J.R. (1979). "Internal waves in the ocean". Annual Review of Fluid Mechanics. 11 (1): 339–369. doi:10.1146/annurev.fl.11.010179.002011. ^ Munk, Walter; Peter Worcester & Carl Wunsch (1995). Ocean Acoustic Tomography. Cambridge: Cambridge University Press. ISBN 978-0-521-47095-7. ^ Spiesberger, J.L. ; K. Metzger (1991). "Basin-scale tomography: A new tool for studying weather and climate". J. Geophys. Res. 96 (C3): 4869–4889. Bibcode:1991JGR....96.4869S. doi:10.1029/90JC02538. ^ Munk, W.; A. Baggeroer (1994). "The Heard Island Papers: A contribution to global acoustics". Journal of the Acoustical Society of America. 96 (4): 2327–2329. Bibcode:1994ASAJ...96.2327M. doi:10.1121/1.411316. ^ The ATOC Consortium (August 28, 1998). "Ocean Climate Change: Comparison of Acoustic Tomography, Satellite Altimetry, and Modeling". Science Magazine. pp. 1327–1332. Retrieved May 28, 2007. ^ Dushaw, B.D. ; et al. (July 19, 2009). "A decade of acoustic thermometry in the North Pacific Ocean". 114, C07021. J. Geophys. Res. Bibcode:2009JGRC..114.7021D. doi:10.1029/2008JC005124. ^ Stephanie Siegel (June 30, 1999). "Low-frequency sonar raises whale advocates' hackles". CNN. Retrieved October 23, 2007. ^ Malcolm W. Browne (June 30, 1999). "Global Thermometer Imperiled by Dispute". NY Times. Retrieved October 23, 2007. ^ Potter, J. R. (1994). "ATOC: Sound Policy or Enviro-Vandalism? Aspects of a Modern Media-Fueled Policy Issue". 3. The Journal of Environment & Development. pp. 47–62. doi:10.1177/107049659400300205. Retrieved November 20, 2009. ^ Fischer, A.S.; Hall, J.; Harrison, D.E. ; Stammer, D.; Benveniste, J. (2010). "Conference Summary-Ocean Information for Society: Sustaining the Benefits, Realizing the Potential". In Hall, J.; Harrison, D.E. ; Stammer, D. Proceedings of OceanObs'09: Sustained Ocean Observations and Information for Society. 1. ESA Publication WPP-306. ^ Morawitz, W.M.L. ; Sutton, P.J. ; Worcester, P.F. ; Cornuelle, B.D. ; Lynch, J.F. ; Pawlowicz, R. (1996). "Three-dimensional observations of a deep convective chimney in the Greenland sea during Winter 1988/89". Journal of Physical Oceanography. 26 (11): 2316–2343. Bibcode:1996JPO....26.2316M. doi:10.1175/1520-0485(1996)026<2316:TDOOAD>2.0.CO;2. ^ Stammer, D.; et al. (2014). "Accuracy assessment of global barotropic ocean tide models". Reviews of Geophysics. 52 (3): 243–282. Bibcode:2014RvGeo..52..243S. doi:10.1002/2014RG000450. ^ Dushaw, B.D. ; Worcester, P.F. ; Dzieciuch, M.A. (2011). "On the predictability of mode-1 internal tides". Deep-Sea Research Part I. 58 (6): 677–698. Bibcode:2011DSRI...58..677D. doi:10.1016/j.dsr.2011.04.002. ^ Lebedev, K.V. ; Yaremchuck, M.; Mitsudera, H.; Nakano, I.; Yuan, G. (2003). "Monitoring the Kuroshio Extension through dynamically constrained synthesis of the acoustic tomography, satellite altimeter and in situ data". Journal of Physical Oceanography. 59 (6): 751–763. doi:10.1023/b:joce.0000009568.06949.c5. ^ Mikhalevsky, P. N.; Gavrilov, A.N. (2001). "Acoustic thermometry in the Arctic Ocean". Polar Research. 20 (2): 185–192. Bibcode:2001PolRe..20..185M. doi:10.3402/polar.v20i2.6516. Retrieved February 19, 2015. ^ Mikhalevsky, P. N.; Sagan, H.; et al. (2015). "Multipurpose acoustic networks in the integrated Arctic Ocean observing system". Arctic. 28, Suppl. 1 (5): 17. doi:10.14430/arctic4449. ^ Munk, W.H. ; O'Reilly, W.C.; Reid, J.L. (1988). "Australia-Bermuda Sound Transmission Experiment (1960) Revisited". Journal of Physical Oceanography. 18 (12): 1876–1998. Bibcode:1988JPO....18.1876M. doi:10.1175/1520-0485(1988)018<1876:ABSTER>2.0.CO;2. ^ Dushaw, B.D. ; Menemenlis, D. (2014). "Antipodal acoustic thermometry: 1960, 2004". Deep-Sea Research Part I. 86: 1–20. Bibcode:2014DSRI...86....1D. doi:10.1016/j.dsr.2013.12.008. ^ Munk, W. & Wunsch, C. (1998). "Abyssal recipes II: Energetics of tidal and wind mixing". Deep-Sea Research. 45 (12): 1977–2010. Bibcode:1998DSRI...45.1977M. doi:10.1016/S0967-0637(98)00070-3. ^ Munk, W. (1966). "Abyssal recipes". Deep-Sea Research. 13 (4): 707–730. Bibcode:1966DSROA..13..707M. doi:10.1016/0011-7471(66)90602-4. ^ Kuhlbrodt, T. (2008). "On Sandström's inferences from his tank experiments: a hundred years later". Tellus A: Dynamic Meteorology and Oceanography. 60 (5): 819–836. Bibcode:2008TellA..60..819K. doi:10.1111/j.1600-0870.2008.00357.x. ^ Dushaw, B.D. ; Cornuelle, B.D. ; Worcester, P.F. ; Howe, B.M. ; Luther, D.S. (1995). "Baroclinic and barotropic tides in the central North Pacific Ocean determined from long-range reciprocal acoustic transmissions". J. Phys. Oceanogr. 25 (4): 631–647. doi:10.1175/1520-0485(1995)025<0631:BABTIT>2.0.CO;2. ^ Ray, R.D. ; Mitchum, G.T. (1996). "Surface manifestation of internal tides generated near Hawaii". Geophys. Res. Lett. 23 (16): 2101–2104. Bibcode:1996GeoRL..23.2101R. doi:10.1029/96GL02050. ^ Munk, W. M.; Wunsch, C. (1997). "The Moon, of course...". Oceanography. 10 (3): 132–134. doi:10.5670/oceanog.1997.06. ^ Munk, W. (2002). "Twentieth century sea level: An enigma". Proceedings of the National Academy of Sciences of the United States of America. 99 (10): 6550–6555. doi:10.1073/pnas.092704599. PMC 124440. PMID 12011419. ^ Munk, W. (2003). "Ocean Freshening, Sea Level Rising". Science. 300 (5628): 2041–2043. doi:10.1126/science.1085534. PMID 12829770. ^ Mitrovica, Jerry X.; Hay, Carling C.; Morrow, Eric; Kopp, Robert E.; Dumberry, Mathieu; Stanley, Sabine (2015). "Reconciling past changes in Earth's rotation with 20th century global sea-level rise: Resolving Munk's enigma". Science Advances. 1 (11): e1500679. Bibcode:2015SciA....1E0679M. doi:10.1126/sciadv.1500679. PMC 4730844. PMID 26824058. ^ C. Harvey (11 December 2015). "Scientists may have just solved one of the most troubling mysteries about sea-level rise". Washington Post. Retrieved 17 February 2019. ^ D. Wagner (16 May 2016). "San Diego Oceanographer, 98, Spurs Research Proving Climate Change Makes Days Longer". KPBS, San Diego Public Radio and TV. Retrieved 17 February 2019. ^ "Walter H. Munk". John Simon Guggenheim Memorial Foundation. Retrieved February 17, 2019. ^ Munk, W.H. ; Scully-Power, P.; Zachariasen, F. (1987). "The Bakerian Lecture, 1986: Ships from Space". Phil. Trans. Roy. Soc. A. 412 (1843): 231–254. Bibcode:1987RSPSA.412..231M. doi:10.1098/rspa.1987.0087. ^ "Provisional Programme: Conference on the variability of the atmosphere and the oceans on time scales of a month to several years". Bulletin of American Meterology Society. 67 (6): 785–803. 1986. doi:10.1175/1520-0477-67.6.785. ^ "Walter Munk Biography". The Royal Society. Retrieved February 14, 2019. ^ Munk, W.H. (1986). "Acoustic monitoring of ocean gyres". J. Fluid Mech. 173: 43–53. Bibcode:1986JFM...173...43M. doi:10.1017/S0022112086001064. ^ a b "The Walter Munk Award". Oceanography Society. Archived from the original on March 23, 2010. Retrieved July 26, 2010. Wikimedia Commons has media related to Walter Munk.